Surprise, surprise, a certain Korean company copies more of Apple’s product design. When Apple launched the iPad mini in October 2012, Apple explained the design: the almost 8″ screen size and thin border allow one-handed use. iPad mini border design obvious? Some might argue that the thin borders is an obvious design choice for 8″ tablets. However, before iPad mini, smaller Samsung tablets copied the 10″ iPad’s design (introduced April 2010) which has even-width borders on all sides. Here are the four small SameSung tablets that were released before Tab 3. For two years, Samsung slavishly copied the overall iPad design, including the screen to border ratio. But the Korean copying company didn’t understand the design philosophy behind the iPad borders. The full sized iPad is designed with “thick” borders so that thumbs can grip the tablet without accidental taps. (Yes, people who did not try to print one of these full sized iPad papercraft mockups complained after Steve Jobs introduced the Apple tablet). When you change the physical size of the device, the borders are no longer useful because it’s too narrow for most people’s fingers. But that was not “obvious” to the SameSung copy machine until Apple released the iPad mini. This entry was posted on Thursday, July 18th, 2013 at 12:55 pm	and is filed under Samsung, iPad mini. You can follow any responses to this entry through the RSS 2.0 feed. So I see how you can say it looks like a ripoff of the ipad mini, but doesn’t it just kind of look like a bigger version of the note 2? Note II with 5.5″ display was marketed as a big arse phone. Samsung devices marketed as tablets follow iPad design. Thanks. Galaxy note 8 was announced February 2013 and released in April 2013, so that could be another example of Samsung following the 2012 iPad mini. They have ripped apple off in the past, but coincidence of timing in reducing the bezel aside, i dont think this is really that similar. Got it. Samsung using iPad design dimensions for 2 years, then changing it months after Apple explained the iPad mini design surely happened by “coincidence”. If it were any other company on the face of the planet, sure. I’d say, hmm, strange coincidence and move on. But this is the company that damn-near copied every single icon from iOS for their own UI. At some point, you have to stop with the apologist nonsense and call Samsung on their shenanigans. And make no mistake, this is not harmless or some silly game. When one company dumps millions of dollars into research and development and creating their own brand identity, it doesn’t do consumers any good to allow other companies to come in and dilute that and destroy it. This kind of thing just confuses the market and hurts consumers who might not understand the differences between some of these products. Scamsung has never copied Apple. Ever. They are always original and come up with their own ideas. Apple has corporate spies working at Scamsung’s HQ and they steal ideas before they’ve gone to market and then Apple rushes out their product to look like they’re first. Scamsung is the victim here and Apple is big, fat meanie. OK, I get it, but this is news how? I don’t hear ANYBODY claiming that individual design elements are in any way protected, and so therefore that company B should feel the least bit of shame about doing something very similar to company A. In any case, I use all sorts of features in my daily life that were invented by somebody else than the company I bought some gadget from. Variable-speed wipers just a tiny example on my car, which must have hundreds, maybe thousands of features that somebody besides Honda Motors did first. It’s still a fine car and there’s so much cross-pollination in that century-old industry that there’s no way to buy a car from a company that has only their own firsts. Well yeah, but it’s a question of degree. We’re talking about two companies here and a repeat offender — your car comparison involves many companies and many features. That’s true on a element-by-element basis, but when many design elements come together to create an image, then it certainly is protected as trade dress. As far as cars go, you seem to be missing the point. Go start a car company and copy another company’s car down to the last detail and see how long you survive in court. I guarantee you that car companies take product design and image very seriously. Just by the way, folks, I’m a strong advocate for protection of IP and a long-term Apple fan. I just think that this is getting ridiculously overblown. Apple will NOT sue Samsung over some tiny detail because they would not win; that means no matter how righteous people want to feel, it won’t do anybody any good. Save your indignation for actual patent violations, etc. Apple is having a hard enough time defending those. I agree even though it’s obvious Samsung is still slavishly copying Apple rather than maybe coming up with designs of their own. If there was a lawsuit, it is beyond doubt that Samsung documents would appear where these things were deliberately and systematically copied. So yeah Samsung is copying, and nobody should deny that. The discussion should be how much copying should be allowed and there I think Apple is taking too narrow a view. Of course Apple innovates and others copy, but that doesn’t make it illegal. Nor should the “invention” of thin borders be patentable and Apple get a monopoly on it until the end of time. I think the Tab 3 falls under permissible copying because of the ugly round top and bottom borders which make it so the product won’t be confused with an actual iPad. The car industry is an interesting analogy because while all manufacturers copy each other, they all do so while still maintaining their own corporate brand entity. Honda might be copying those cool BMW LED tail lights, but they won’t make a car that actually looks like a BMW. They will still make a Honda. The Tab 3 seems to follow this tradition. 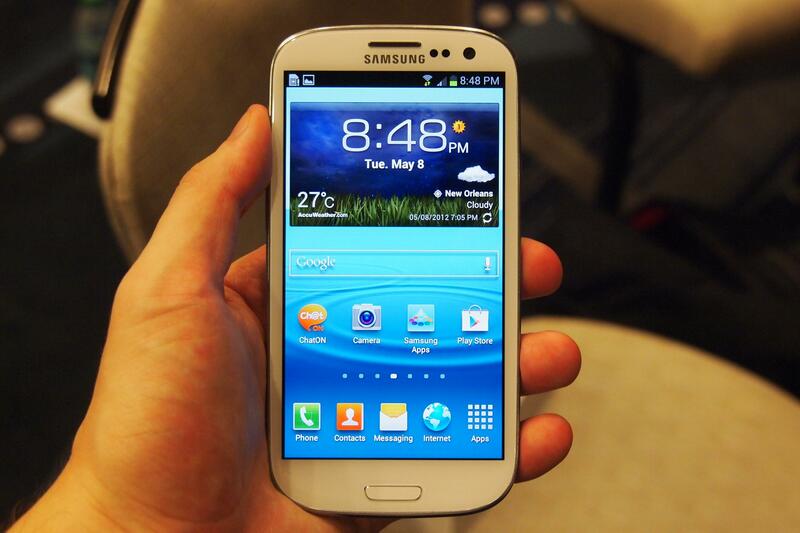 It looks like a Samsung device, pretty much a blown up SGS3 / 4. It doesn’t ape an iPhone. Samsung should be free to do this, but they should also be forced to remove the various iPhone clones from their lineup (Samsung Ace and whatever). so, if samsung said they were ‘inspired’ by apple, that would be OK? because, that’s what apple does (braun, swiss clock, etc). give me a break. have a look at hp/compaq’s tc1000 and tc1100. it’s a thin-bordered tablet. apple must have copied them. The difference is that Apple used design principles from one source and a specific class of products and applied those principles to a difference class of products. You can’t say Apple is doing the same thing Samsung is unless you’re arguing that Braun had a tablet device that Apple copied the design from. It crosses the line from being inspired to plagiarism when you take design traits from a particular product and apply it to the same product you make. Your HP example doesn’t really fit. There may be a couple similarities which one can reasonably write off as coincidental, but Samsung is copying every damn detail. Every detail. It’s just shameless and stupid. the difference — apple isn’t in the razor or clock business (or even same era as Braun or the Swiss clock). samesung is in the same exact business and timeframe as the apple products it continually apes. It’s the technology that is finally ripe for this kind of design. Samsung simply could not manufacture thin-bordered tablets before. iOS 7 was chop full of copy of everyone, yet this is still an issue? Really? Seems to me it’s still iOS with a different skin. How about this: what did smartphones and their UI look like BEFORE the iPhone? Now, who’s copying who? Just like iPhone? Just look at palm OS. Although this kind of lookalike bait-and-switch is apparently benefiting Samsung in the short-term, I think it benefits Apple in the long-term because it is gradually killing the generic technology industry. Consumers who were trained that a CD/DVD Player of any brand was a CD/DVD player are finding out that the Samsung iPad they bought is not actually an iPad and their iPad envy is only amplified and next time they shop only within the safe and simple confines of Apple Store. Samsung has established that generic tech is a fake Apple Store with devices that cost about the same but have less than 1% of the functionality. Microsoft is doing their part with their fake Apple Stores also. Same less than 1% functionality. One of my roommates was a perfect example of this. He had a Samsung phone and tablet and Microsoft PC yet could not do hundreds of desirable things that all his Apple-using roommates were doing with their similar-looking devices and it made him feel stupid and left out. Plus he was dealing with viruses and we were not. Finally he got an iPhone and then within a month or two, a Mac, and soon after that, an iPad. He is never going back to generic tech ever again. He just learned the biggest tech lesson of his life and he’ll never forget it. Well to their credit Samsung has been building its own design language ever since the lawsuit. It’s baffling they still even make the copy products, for the reasons you mention. They should just shelve them. I think they don’t because that’s how they got their big break – by appealing to people as the “same only cheaper” as an Apple product. Like you, I don’t think it’s a good long-term strategy. Of course Samsung being Samsung, they just throw dirt at the wall and see what sticks. They have enough devices to follow 5 different marketing strategies simultaneously. I think the SGS3/4 line will win out, where they look similar enough to Apple products to indicate that they’re doing the same thing, but different enough to build their own brand. Their remaining problem is product quality but Google is doing all that work for them, making Android better and better. Portable electronics aren’t the only things Samesung copies. Have you walked into an appliance store lately? You should really check out what you’ll find. Washing machines/dryers, dishwashers, refrigerators etc. The Nikon N1 camera is another example. I broke down and bought the Samesung clone, the NX1100 – is it a coincidence the model number starts with the letter “N” and the number “1″ is in it? I really have my doubts. Based on experience, they’re not as good as the items they were “inspired” by. I know someone who had one of the refrigerators. He constantly had problems with it. My camera had to be exchanged because it totally died the 3rd time I used it while on vacation. It’s a good thing I took out the extended warranty through Sam’s Club. Speaking of warranties, when I tried to register the camera and the cheesy Galaxy Tab 2 7.0 that Samesung GIVES AWAY with them through Sam’s Club, Samesung doesn’t recognize the serial numbers for either of them, so I can’t get them registered. Go figure. > (braun, swiss clock, etc). Apple does not make shavers and food processors that were inspired by Braun. Apple makes devices that Braun never made, according to the same design principles of Dieter Rams. Apple licensed the Swiss Clock when asked. Samsung has refused to license design work they stole from Apple. It is a matter of court records that Sansung clones Apple products in order to trade on Apple’s marketing. Plus we have all seen tge products come out 6, 12, and 18 months later. I can remember seeing an iPhone poster in a Sprint window in 2009 and thinking, “Sprint has the iPhone now?” and later found out it was a Samsung phone with all the exact same metrics. You are not going to somehow make the case that it is not copying. You are being totally irrational, ignoring the obvious facts. I think the thinner bezel is not only a copied design thing. I guess even at Samesung they get the obvious notion that a narrower bezel looks more aesthetic. See their almost all-screen flatscreen TV designs with hardly any bezel at all. I think the direction was clear and there was a technological restraint. Lol samsung has copied pretty much all the device deaigns from apple an if u cannot see the comparison then ur clearly a samsung fanboy in denial i mean the galaxy tab 3 similar thin bezels an white also an same size cmon gimme a fkn break samsung is a shameful company enjoy ur plastic made apple replicas u apple wannabees…. Looks more like an evolution of the early 2012 Galaxy S3 to me (http://www.digitaltrends.com/wp-content/uploads/2012/05/samsung-galaxy-s3-hands-on-9.jpg) rather than an iPad Mini ripoff. Just because they have copied Apple in the past, doesn’t mean they are doing it now. Otherwise you could say that Apple copied Google when it backtracked on small tablets. FYI, Google didn’t want Android manufacturers using Android 2.x for tablets, since it was nothing more than an overblown phone UI. That was the only Android OS available when the original iPad was released, and anything over 7″ made it unusable. On top of that, those companies couldn’t match Apple’s price, let alone beat it, even if they had an OS to use on a larger tablet. That’s why the hideous 3.0 Honeycomb came out, which was left in the dust pretty quickly. Another FYI, GOOGLE doesn’t MAKE anything. They write Android as an advertising engine. Anyone who’s too stupid to realize that needs to get some serious help. They approached Asus about making the Nexus 7, and needed it as cheap as possible. Now, reports are popping up everywhere about RAM failures (Samesung RAM, btw), turning those tablets into paperweights. Good luck getting timely updates to correct the problem. Neither Google nor any of the Android manufacturers really care about the customers. They care about sales (Samesung etc.) and ad revenue (Google), period. First, Galaxy is a phone and marketed as a phone, and guess what? Samsung Galaxy followed iPhone design until Apple sued them, then they attempted to differentiate some of the design elements. Second, as already noted in the article, Android tablets from Samsung followed iPad design for two years, until iPad mini was released. Isn’t this standard for Samsung across all product lines? TVs, DVD/Blu-Ray, Refrigerator, etc. I look at most of their products and where they don’t have a good market share, they copy the market leader until they catch up. Not sure why you buy from a company like that…..
Bingo! I just hope the Samesung NX1100 camera I bought (and had replaced already) keeps working for a good while. Otherwise, I wasted a lot of money compared to the Nikon N1 I could’ve had for a few dollars more. Adding a bunch of useless bloated features isn’t innovation, but many people just can’t see through the smoke & mirrors that is Samesung. When will they learn? Even Hyundai and Kia started being semi-original lately. If you do not comply, your hair will be pulled. I baked bread last night, so I think I’m copying and violating some apple patented designs of natural curves…. You have zero grasp of the nuances of the topic at hand and making a fool of yourself commenting in such an clearly uninformed way. BTW, Americans invented just about everything that powers the Internet–the technology, protocols, infrastructure, operating systems and hardware. And now you’re using that American innovation to denounce them. Nice. Typical America-hater. So now individual permutations of width of things are “inventions” that others must not “copy” now? You guys are all idiots! Imagine if every book publisher on the planet would have their own sacred margin-width that they “invented” because they were first using it (or first patented it) that others must not use, and latecomers would be stuck with giant book with 20+”-margins around the text because all the other ones were taken. But hopefully soon the technology will allow screens to cover the whole device, and everyone will be using that, and this BS will be over. Let me see. I bought an original ipad in 2010. A few moths later due to a mistake I received a credit from “a large online retailer” and I decided to try the Samsung original tablet, 7″ galaxy tab. I thought the size was interesting. Looking at it, did anyone notice that Samsung made their chargers and cables to look just like the ipad ones, look at them. A perfect copy. I don’t know it was by design but nobody else had chargers & cables like that, only Samsung. Anyway I sold the G Tab because, as Samsung usually does (I know that now), it was never updated with a new OS. By 2012 I had an ipad 2. With the money from the 7″ I decided to try the brad new G Tab 8.9. I realized that 7″ is not the right size for a tablet, especially with the 16:9 screen. Too tall & too narrow. The 8.9 also came with 16:9 standard size for androids. But even as a new product, it looked a lot like an ipad, plus the chargers and cables still were just like the ipad. Maybe Samsung doesn’t copy Apple, but they sure look like their designer do homage to Apple small details. You can say what you want, but down to the chargers and cables, please. Oh, before I forget, yes, my late 2012 8.9″ G Tab, is not getting anymore software upgrades. Yes, thank you very much Samsung. By releasing so many tablets per year to see what sticks, you made my 8.9″ Galaxy Tab obsolete before it was one year old. Is it really comfortable to use a tablet one-handed? I use my thumb when holding my phone, but for a tablet .. my thumb isn’t that long. Yeah, sorry for dumbing it down. Love hearing the VP guy explain passionately why this is not just a smaller ipad, but a masterpiece of concentration. cmon man, it’s a small ipad :D or a big iphone. “down to the last detail”? Try to install an iPad/IPhone-app on a Samsung-device. Or try to take a part or add-on made specifically for iPhone, like the usb/charger-cable or screen-glass, and fit it to a Samsung phone. Then come back here and tell us how well that worked. Shouldn’t be a problem, unless the copying “down to the last detail” is complete BS. MatsSvensson’s post is an example of what happens when a fanboy refuses to see the obvious that’s sitting right in front of him and wants to find some fatuous way to deny the truth. Very sad. I bet elsewhere you’re ranting and raving about how Apple copied Android with iOS 7 despite your willingness to split the finest of hairs here on this topic to deny the obvious ways in which Samsung has slavishly copied Apple. I’d bet money on that. iOS7 looks nice enough to me. Perhaps its sign they will concentrate on making their own products better, rather than going “mine, mine, MINE!” and licking all the doughnuts at the table. I would prefer a lighter color-scale on Android too. Hopefully they will ditch the ugly vista-blacks soon, and not stick with it just to be different. And that ranting & raving you seem to be upset about, is apparently in your own head.